Camping Key Europe card is packed with great offers while touring around Ireland. Many campsites offer nightly discounts to Camping key card holders and the card also entitles you to lots of great discounts and offers at attractions, visitor centre's, ferries, etc. throughout Ireland. Camping Key Card special offer: Low Season €2 off nightly unit price. High Season €1 off nightly unit price. €1 discount per person off all green fees on 18 hole pitch & putt. Not to be used in conjunction with any other offer. 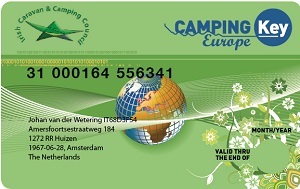 Camping Key Card special offer: Present your Camping Key Card and get one River Valley Token worth €2.50 for every night. These tokens can be used for: Kids Clubs, Archery, Airsoft Shooting, Crazy Golf, Tennis, Par 3 Golf and Badminton.